My son is obsessed with marionberry pies so as soon as I saw this candle, I knew I wanted to review it. I imagined sweet blackberries as the base of this scent loaded with sugar and maybe – hoping – there would be some bakery pie crust in the mix as well. 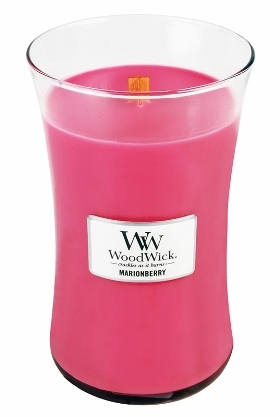 A sweet and juicy scent bursting with wild berry accord and hints of tart blackberries. 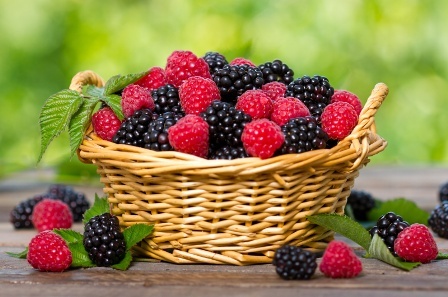 I don’t know what “berry accord” smells like but tart blackberries – check! The wax smelled (minus the pie crust) exactly as I imagined… tart blackberries loaded with sweet sugar. Definitely a nice and fresh fruity scent that had my mouth watering. I liked it… now let’s see how this candle performs! I lit this candle in a small bathroom to start out and that’s where it stayed till the last drop of wax. I wanted “strong” and definitely achieved that in a small room. Once the wood wick was lit, it took a good half hour to reach a full melt pool and the aroma… a tart and refreshing berry scent. I smelled tangy raspberries and blackberries drenched in sugar. Loved it! Strength – This candle wasn’t super strong but did well in a small room. I would rate it an 8 out of 10 in a small room. Not sure I would attempt it in anything larger but that’s up to you if you give this candle a try. Have I mentioned how much I love the sound of wood wicks burning? This candle crackled and popped the entire time and it sounds so dang cool!! I don’t think one person in my house doesn’t end up commenting on the sound effects and how much they like it. How can you not? The wick sounds like a subtle kind of cracking blow torch. I love it! The scent was pretty awesome as well. Sweet blackberries and I swear, raspberries too. It smelled like plump berries drenched in sugar. YUM!! Highly recommend this one to all you berry lovers out there. I’ll definitely be purchasing this one again. Visit Wood Wick’s page on Yankee’s website. Yes, I recently discovered that Woodwick had been bought by Yankee! I was going to write you about that and a great Woodwick candle I discovered. I don’t know if you have Meijer’s stores in your area, but it was there that I realized what was going on. They had sales on both Yankee and Woodwicks. I bought a wonderful Fall candle called “Autumn Festival” that was the only Woodwick candle they had on clearance, and even though I know it’s a little late (or a lot early!) for Fall scents, which are my faves, I couldn’t resist. It smells wonderful, to me almost a mix of pumpkin, apple, caramel and a little spice. What’s odd is that I went on Woodwick’s website, which diverted me to Yankee, but the scent wasn’t listed, even though on the jar there was a label that said “new”. I’m guessing it was quickly discontinued, but who knows why. It’s very pleasant, and I’ve gotten to be pretty particular. I too love the sound of that burning wick! On a related note, though like many of us, I’m not a huge Yankee fan, I found a Yankee Candle at Big Lots that apparently was discontinued. I think that’s the case with all Big Lots candles, yes? This one was called “Sugar & Pumpkin Spice”. Great bakery scent, more like a buttercream than a pumpkin but really nice!